We managed to hit the road just after 9am from Karijini despite having to jump start our car again! 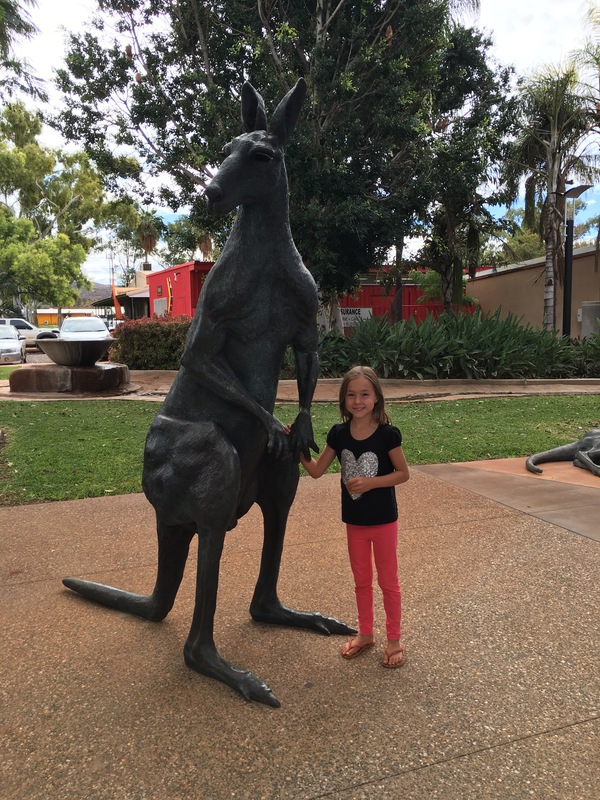 We stopped off at Tom Price for some grocery shopping and managed to do that with KC mum wondering around the aisles also while all of the kids played on the grassy area out the front. The spruiking family we’d met in Broome lived in Tom Price so I’d messaged to say we were in town and Mum and three year old twins met us in town for a quick catch up and she even bought some home made chocolate cake for all of us! We had some lunch then decided after all three of us mums chatting, that trying to get all the way to Emu Creek Station today would be too much and we’d be setting up in the dark so we settled on a free camp on the side of the road that had good reviews on Wikicamps. We farewelled our Broome spruiking friends with a promise to keep in touch before we set off via the shortcut along a dirt road – our KC family needed to stick to bituman where possible so when we got to the freecamp spot we found an area where we could both fit and set ourselves up while we waiting for them to arrive. 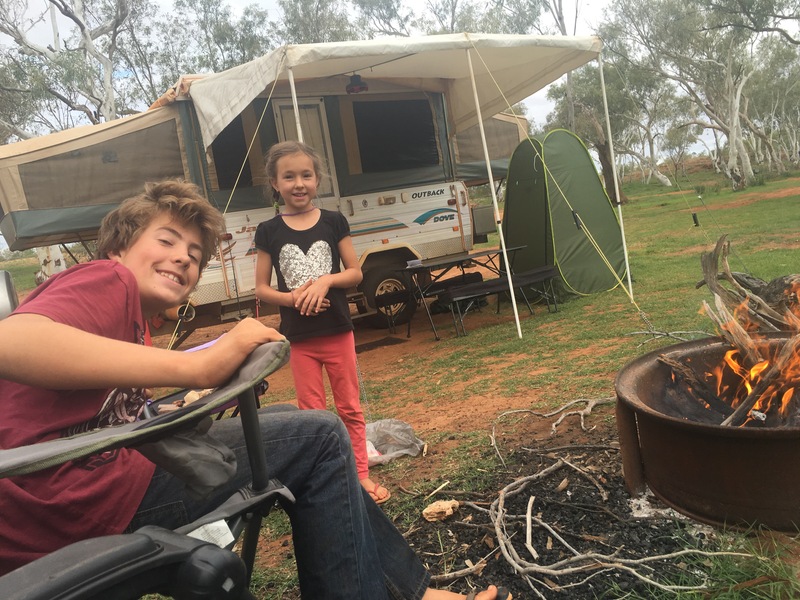 The kids went off to look for firewood and Miss6 nearly lost her mind when she saw the KC car turning into the free camp area – she was finally going to get to camp right next to her friend for the night! We made some dinner and lit the fire to sit around and chat for the night. It was a quiet little overnight rest area with the exception of a couple of little girls squealing with delight as they played for the night. Away from any major town again the stars were out brightly shining too. 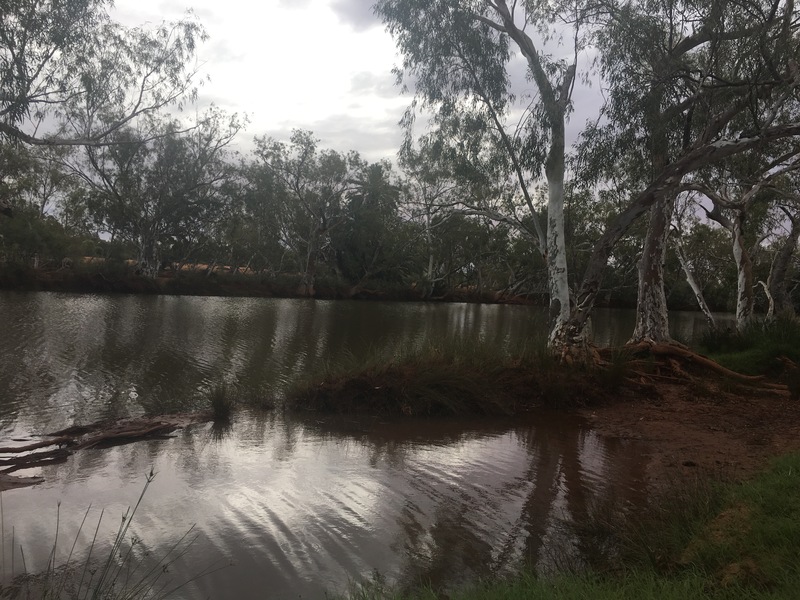 During the night I thought I heard the sounds of rain and in the morning I woke to the sounds of light rain – what a change it was to have to think about packing up in the rain after the months of warm winter weather we’d had. The rain was only some light spits and didn’t last long so packing up wasn’t too difficult and we managed to get out of there without being the last campers to leave. 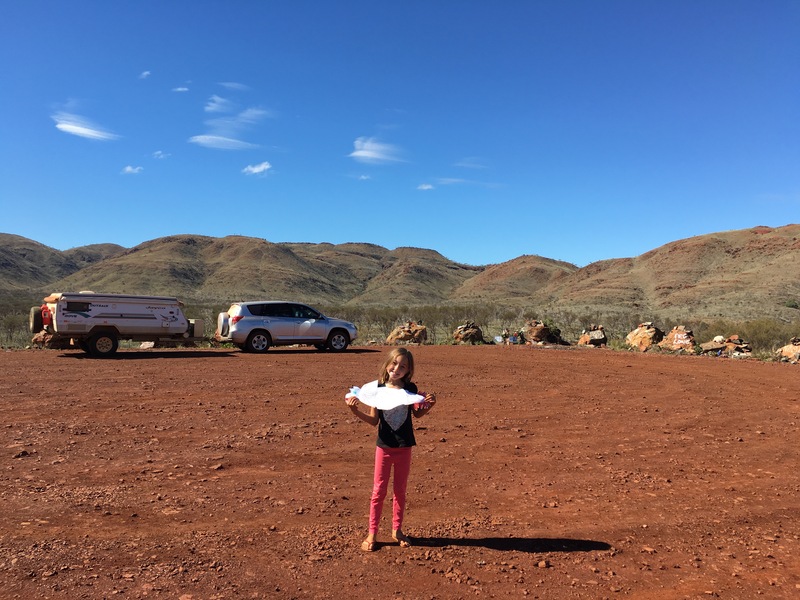 Our KC family were going to go all the way to Exmouth but we wanted to camp at Emu Creek, a station stay along the creek that we’d heard lots of great things about with 20km of dirt road to get into preventing KC family from joining us. We farewelled our KC friends with hopes that we’d catch up again down the track and possibly in Cape Range National Park and hit the road. The turn off into Emu Creek Station didn’t feel that far down the highway and the dirt road to get to the entrance was in really good condition. When we arrived there was no-one about but I’d read that the owners still worked the farm and also ran the Burger Bus up on the highway so weren’t always around to greet campers. 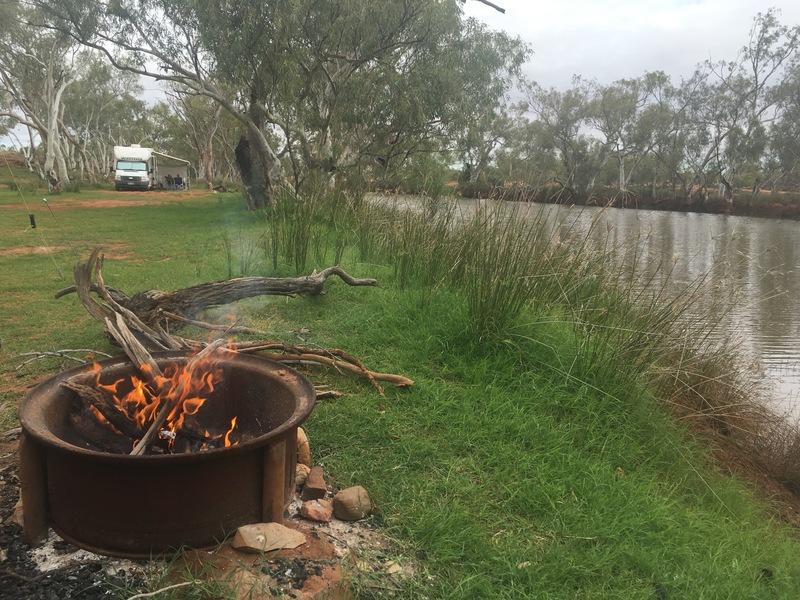 We drove down to the campsite along the full flowing creek and found a lovely grassy spot with a big fire pit and set up camp. The campsite was surrounded by large trees and overlooked the creek. We thought there might be some rain coming over the next couple of days so we set up the awning and went off to collect some fire wood while Miss6 stayed at camp getting to know our neighbours and showing them her rock collection. I went back to the farmhouse to leave the owners a note advising them where we’d camped and how long we wanted to stay and ended up bumping into Darryl on the way back to camp. Miss6 and I stayed at the farmhouse with him while he made us a hot cup of tea and hot chocolate and told us all about the farm and some of its history – he was absolutely lovely and I think Miss6 was in farm heaven listening to his stories – especially when she got to meet and pat his dog Murphy. We got back to camp to find that Master14 had already lit the fire so I sat there with a glass of wine and read some of my book while the kids relaxed and played. We had some nice hot showers before roasting some potatoes in the fire for dinner and then sharing some marshmallows with our neighbours to toast on the fire. It began to rain a little on and off so we went back to the van and retired for the night. While we only got about 2.5mm of rain overnight, it was enough to keep me waking throughout the night mentally checking everything we had was safe and dry. Miss6 and I were up early the next morning to watch our neighbours take out the farm kayaks on the creek for an early morning paddle. It began to rain while they were out and by the time they got back they looked like drowned rats so I offered to make them both a hot cuppa while they dried off. They had a card game called Wanted and brought that over and sat with us under the awning (I was glad we bothered putting it up) playing cards and drinking our hot drinks for a while before they packed up and headed off for their next destination. I made the kids some pancakes for a late brekki while we watched a movie and the rain kept falling outside. It rained for most of the day so we watched a second movie and ate our lunch inside. The rain finally stopped in the late afternoon so we put on our bathers and a jumper and hopped onto the kayaks to have a paddle up and down the creek. Miss6 hopped on the pink kayak (or cacoon as she seems to call all canoes!) with me while Master14 got the blue one to himself. The water in the creek was surprisingly warm and shallow and to my delight, none of us fell overboard on our maiden voyage. We paddled up and down the creek and parked the kayaks on the other side of the creek to enjoy a little walk around before heading back to camp to light the fire. We had some hot showers and I did a load of washing before we sat around the fire and ate dinner. Despite having done not much at all that day, I was surprisingly exhausted by bed time and not looking forward to packing up in the morning. We decided that it was camps like this one, in the bush away from it all near a river or creek and picturesque surroundings, that we liked the best and could easily have stayed here for much much longer. There were a few spits of light rain during the night and early morning but it seemed to hold off during pack up. I needed to change a fuse in the car and despite having started the car in the morning to check the battery (& started and run the car for half an hour the day before), when I went to start the car again to leave it was flat and needed a jump start. I drove up and grabbed the wet clean laundry while Miss6 said farewell to Murphy and we all thanked Darryl for having us. At the end of the dirt road there was a rest area where Darryl’s wife ran the Burger Bus so as we left we stopped in there for a couple of bacon and egg sandwiches for late brekki and thanked Joyce also for having us on their farm. 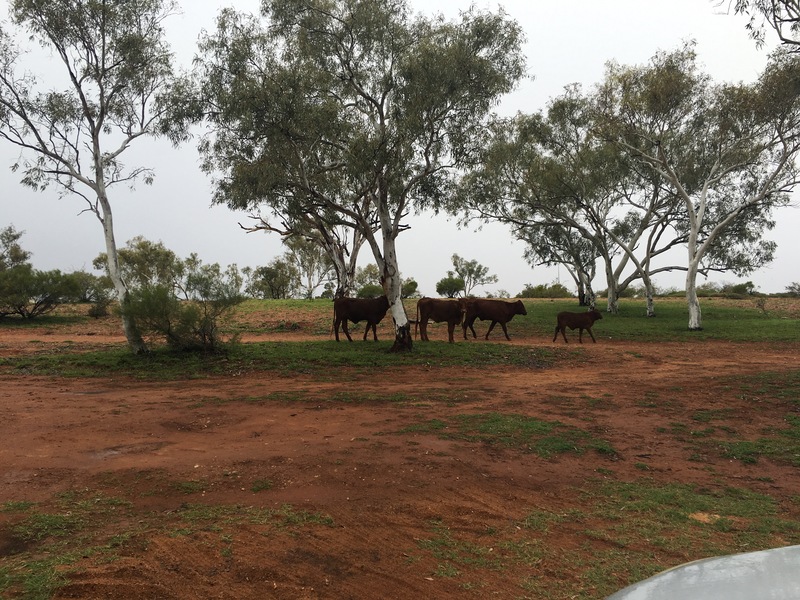 We set off for Exmouth and Cape Range National Park with about an inch of mud on the car and van from all the rain and the dirt road – with any luck the rain while we drive will wash some of it off.